Mountain biking on the all-dirt track is a fun option! Downhill bike tours offers a unique opportunity to coast through tropical rainforest. Your guide will pick you up at your Waikiki hotel (or at an arranged meeting place if you aren’t staying in Waikiki) and then shuttle you to the top of a road high above downtown Honolulu. Stop at overlooks that feature panoramic views of the skyline and beaches of Honolulu and Waikiki, with iconic Diamond Head Crater as a backdrop. This 5 mile ride is available on its own, or you can combine it with a waterfall hike or a snorkel / sail (or both)! Jurassic Park E-Bike Tour is a great way to experience Kualoa Ranch’s most popular landmarks from a unique and eco-friendly vantage point. Explore the picturesque “Jurassic Valley” with an electric assisted motor mountain bike (with 4 inch wide tires). Your guide will take you on a leisurely 90 minute adventure starting from the Visitor Center and into the valleys. Experience the movie sites from Jurassic Park and Jurassic World, Kong Skull Island, Godzilla, 50 First Dates, LOST, Hawaii Five-0 and more throughout the valley! 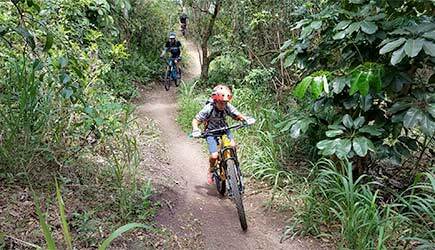 Explore the rain forest of Oahu on mountain bikes! We have 2 thrilling Mountain Bike tours to choose from! The North Shore Tour is fun for everyone with light challenge for skilled riders. 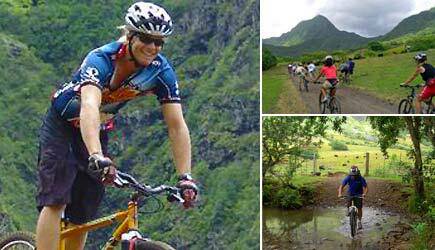 Mountain Bike Tours offers Hawaiian single track mountain biking. Capture the thrill of trail riding as you explore the rain forest of Oahu! If you have a passion for off-road trail riding, and the skill to negotiate narrow single track, you will love their guided rides. Choose between downhill bike tours and combos! If you are extending your stay with extra days in Honolulu before or after your cruise, you can do any of these Oahu bike tours!